Perak is known as the Land of Grace and it is the 2nd largest state in Peninsular Malaysia. Perak is a great holiday destination that packs with sun, sea and sand. People here are warm and friendly and always welcome visitors like you to a rich and vivacious culture and history town. Perak is covered mostly with mangrove forest as well as tropical rain forest. The magnificent beaches and excellent green attracts visitors from all over the world throughout the year. There are lots of beaches in Perak. The popular beaches are like the Pantai Teluk Belanga, Pasir Panjang, Teluk Sekadeh and Perindu. Many water sports activities are available for adults and children as well. Visitors can sail dinghies, cruise on a big yacht and if you feel like getting some adrenalin rush, you may try the jet-ski, windsurf and parasail. The beaches in Perak are all clean and park with good range of activities. Some of the beaches even allowed you to have boat trips, snorkeling and swimming. Besides, visitors can go for horseback riding at the Perak Turf Club. Some of the hotels can arrange the horseback riding trips too. It is a popular activity here as you can ride on horseback while going around exploring the countryside. There are riding lessons available for beginner and even young children. For birds’ lovers, you should visit the Kuala Gula Bird Sanctuary. You will find hundreds of bird species here and you will have a chance to see a wide range of exotic birds as well. Meanwhile, visitors can also meet other interesting mammals in the bird sanctuary like the ridgeback dolphin, smooth otter and dusky leaf monkey. The best visiting season is between August and December where it is the birds’ migratory season. If you are traveling with children, the 1st and only Deer Farm in Malaysia is another interesting place to visit. It is located near the bird sanctuary. There are about 100 deers roaming freely on the 100 hectare site. Tambun Hot Springs offers you a relaxing and natural hot bath. The hot springs are water from underground which said to have relaxing and healing qualities for aches and pains. Facilities like saunas and changing room is available as well. The hot springs is located at the foot of a limestone hill and it is open daily. On the other hand, have a stop at the stunning Kuala Woh Jungle Park for a picnic while enjoying the waterfalls sight. There are hot water pools in the park and it is also a great place for fishing too. Gua Tempurung is the largest natural limestone cave in Peninsular Malaysia. There are 5 large domes found in the cave and each has its own special features, different water levels and temperatures. There are several different type of tours available for visitors to join with the duration ranging from 40 minutes up to 3 and a half hours. The complete tour includes visiting all 5 domes and the return journey is through the underground river. It is quite a challenging and strenuous tour if you choose the 3 and half hours complete tour but it is worthwhile. 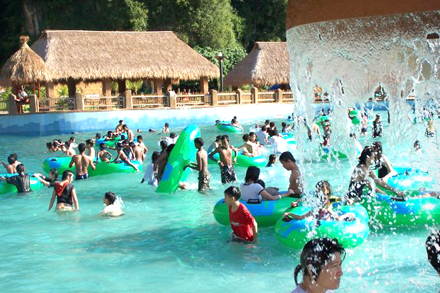 On the other hand, do visit the Lost World of Tambun for some fun and exciting water rides. There are water based and land based amusements like wave pool, sandy beach, giant water slides, carousel, dragon flight ride and more which are suitable for all ages. Something unique about the Lost World of Tambun is that it comes with the hot spring facility. There are number of pools, Jacuzzis and a steam cave with hot spring.